Dominik received his great Master of Science Certificate. 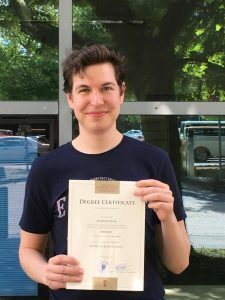 In his Masterthesis he investigated the molecular mechanisms following dopamine D1 receptor manipulation via positron emission tomography in cooperation with Dr. Kristina Herfert and her team at the Department of Preclinical Imaging and Radiopharmacy in Tübingen. Dominik now started his PhD in our lab here in Bochum. He is going to further investigate the mechanisms of our rat model for bipolar disorder. Congratulations and welcome to our team!